Went riding this morning around the Schuylkill River along Kelly and West River Drives. It was not my first morning ride of the season, but today was the first group ride with my gang of biker chicks, several of the Sue's. I've ridden at least two or three times this spring in the early morning, though today we did do a "double loop" adding on some extra miles to make it worth getting up at 5:45 am. There was a real snap and bite in the morning air. In my eagerness to get out and ride, I went without a jacket or long sleeves. Stupid thing to do, I was so cold that my arms, hands and toes were numb for the first 20 miles. The morning light was gorgeous and the air was mostly clear and calm. Along certain bends on the trail, I would catch a pleasant whiff of the river. The smell of the river, before the heat and humidity take over and bring in the funk, reminds me of summer camp. There's an earthy muck and mud smell that takes me back to my childhood skipping rocks into the creek; "fishing" for salamanders under rocks; digging for clay along the banks of a stream. That good deep smell of composting leaves, twigs and branches and cool damp forest air. The light this time of year is also magically golden and hazy. The pollen thankfully doesn't affect me, so I can "appreciate" the haze it lends to a cool spring morning, creating sunbeams and a fuzzy effect on the water's calm surface. Today we saw scads of baby Canadian Geese. 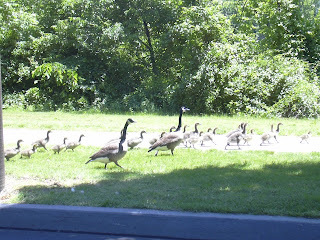 It must have been a fantastic mating season; I've never seen so many baby goslings over the course of a ride. We saw about 6 different family groups, each with at least a half dozen downy babies in tow. 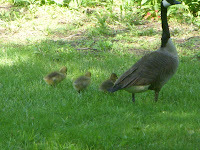 Some of the goslings were having a set in the grass, minding themselves while others were out grubbing, fattening themselves along with their relatives. These were the biggest crowds on our early morning weekday ride. Unlike the roller bladers, joggers and casual cyclists who crowd the trail on the weekend and make it difficult to pass or ride efficiently is that are the droppings these trail blazers leave along the path. What's a little guano on my tires? Gives my dog, Hamlet, something to sniff when I get home!